Not sure if my comment got sent...so here it is again. Triad Radio was a VERY influential program from '69 until '77 after which Chicago's WXFM changed formats. 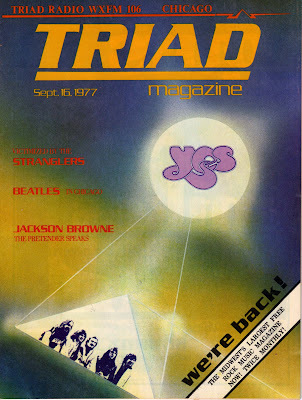 The magazine was born out of the radio show and had it's best days then, but after the show left the air, there was a stab at trying to bring back the magazine. It was pretty lame - missing all of the best things about the original version - especially no daily listings of the great free-form music that used to live on the airwaves. Tho, I have to say that I discovered the first punk dance club in America - possibly the world - called "La Mere Vipere" as the result of a cover article done about a month later (their third issue in the new style) and that changed my life forever too!